By Chris Williams on May 17, 2011. Q. Can you identify this creepy thing I found in my bathroom? It’s about 1-1/2 inches long, light brown in color, and has long legs like a spider except it has lots of long legs and it moves very fast. A. Of course we can’t really do a positive identification without actually seeing the pest in question, but I would guess you’re talking about a house centipede. The “lots of long legs” that you mention is the key clue. The house centipede is sometimes called a “hundred-legger” but usually has only 15 pairs of banded legs. The antennae and the last pair of legs are nearly twice the length of the body. The long back legs are used to lasso and capture prey. Its legs break off easily if it is handled (and continue to twitch!). Millipedes also have lots of legs but their legs are short, not long, and millipedes are dark in color. Centipedes are common pests outdoors in damp areas around foundations or under bark, mulch, or debris. They are beneficial predators on insects, spiders, earthworms, snails, etc. Sometimes outdoor centipedes find their way inside, but the house centipede is the only centipede that can actually live in indoor conditions and can reproduce inside. They don’t damage household furnishings. House centipedes can bite if handled but rarely break the skin. House centipedes move very quickly, darting about, and they can climb walls. They spend the day in dark, damp locations (basement, crawlspace, laundry room, bathrooms) and actively forage for their prey at night. House centipedes are often found trapped in sinks or bath tubs. They’re also found in floor drains without water traps, especially drains connected to dry sumps, and in cardboard boxes and other items stored in damp areas. House centipedes rarely occur in large numbers. 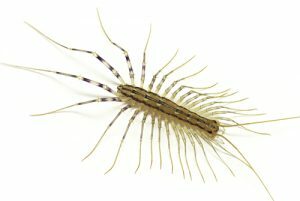 If you see house centipedes frequently, it may mean that your real problem is another pest since centipedes feed on other household pests such as silverfish, carpet beetle larvae, cockroaches, bed bugs, and spiders. Control of house centipedes usually involves (1) using ventilation or dehumidifiers to reduce the dampness that draws centipedes and keeps them alive, and (2) reducing the indoor prey that they are feeding on. Call Colonial; we can help.